Dolichos lablab is native to tropical Africa. From May through hard frost this Hyacinth Beans produce a glorious display of flowers. Dolichos lablab is semi-hardy and may make a second season, it does here most of the time and our temperatures get into the mid-teens where they are growing. I keep seeds and start it over each year. I use it to cover the chicken coop in the summer. The Purple Hyacinth Beans are less than a taste treat in my opinion but fresh beans are used as a food crop. Dried beans are reported to give a bellyache. For this amount of beauty I will put up with its minimal food value any time. The green variety of Dolichos lablab is a food crop in India. Thomas Jefferson thought well enough of it to grow Hyacinth Beans at Monticello. My Dolichos lablab vines grow to about 15 feet and twine around the wire of the coop. Both green and purple seeded Hyacinth Beans are available through the links. 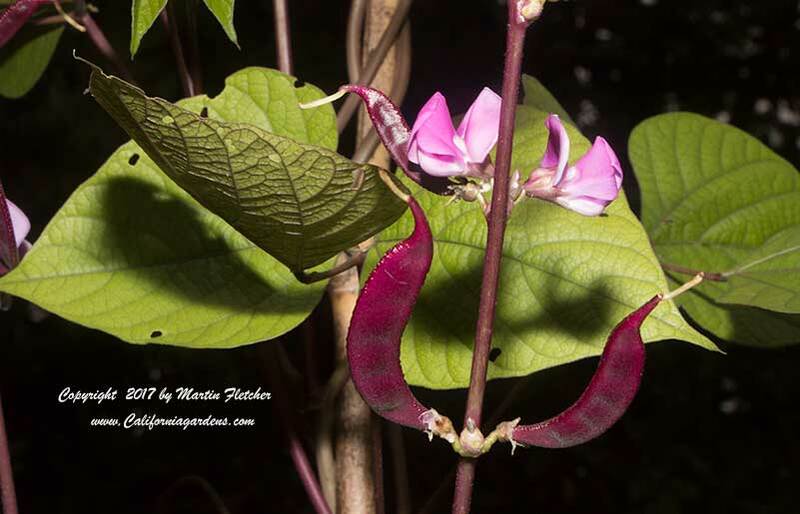 Flowers and foliage of Dolichos lablab - Hyacinth Bean. High resolution photos are part of our garden image collection.